^ Alexander, Amir. Space Topics: Extrasolar Planets Astrometry: The Past and Future of Planet Hunting. The Planetary Society. [2006-09-10]. ^ 2.0 2.1 See, Thomas Jefferson Jackson. Researches on the Orbit of F.70 Ophiuchi, and on a Periodic Perturbation in the Motion of the System Arising from the Action of an Unseen Body. The Astronomical Journal. 1896, 16: 17. doi:10.1086/102368. ^ Sherrill, Thomas J. A Career of controversy: the anomaly OF T. J. J. See (PDF). Journal for the history of astronomy. 1999, 30 [2007-08-27]. ^ Heintz, W.D. The Binary Star 70 Ophiuchi Revisited. Journal of the Royal Astronomical Society of Canada. June 1988, 82 (3) [2007-08-27]. ^ Gatewood, G. Lalande 21185. Bulletin of the American Astronomical Society (American Astronomical Society, 188th AAS Meeting, #40.11;). May 1996, 28: 885. Bibcode:1996AAS...188.4011G. ^ John Wilford. Data Seem to Show a Solar System Nearly in the Neighborhood. The New York Times. 1996-06-12: 1 [2009-05-29]. ^ Alan Boss. The Crowded Universe. Basic Books. 2009-02-02. ISBN 0465009360. ^ Pravdo, Steven H.; Shaklan, Stuart B. An Ultracool Star's Candidate Planet (PDF). Submitted to the Astrophysical Journal. 2009 [2009-05-30]. （原始内容 (PDF)存档于2009-06-04）. ^ First find Planet-hunting method succeeds at last. PlanetQuest. 2009-05-28 [2009-05-29]. （原始内容存档于2009-09-04）. ^ * Externally Dispersed Interferometry. SpectralFringe.org. LLNL/SSL. June 2006 [2009-12-06]. D.J. Erskine, J. Edelstein, D. Harbeck and J. Lloyd. Externally Dispersed Interferometry for Planetary Studies (PDF). (编) Daniel R. Coulter. 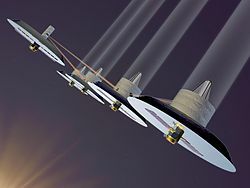 Proceedings of SPIE: Techniques and Instrumentation for Detection of Exoplanets II 5905. 2005: 249–260. ^ Townsend, Rich. The Search for Extrasolar Planets（Lecture）. — (Department of Physics & Astronomy, Astrophysics Group, University College, London). 27 January 2003 [2006-09-10]. （原始内容存档于2005-09-15）. ^ A. Wolszczan and D. A. Frail. A planetary system around the millisecond pulsar PSR1257+12. Nature 355 p. 145-147. 9 January 1992 [2007-04-30]. ^ Deming, D.; Seager, S.; Richardson, J.; Harrington, J. Infrared radiation from an extrasolar planet (PDF). Nature. 2005, 434 (7034): 740 – 743. PMID 15785769. doi:10.1038/nature03507. （原始内容 (PDF)存档于2006-09-27）. ^ 27.0 27.1 J.-P. Beaulieu; D.P. Bennett; P. Fouque; A. Williams; M. Dominik; U.G. Jorgensen; D. Kubas; A. Cassan; C. Coutures; J. Greenhill; K. Hill; J. Menzies; P.D. Sackett; M. Albrow; S. Brillant; J.A.R. Caldwell; J.J. Calitz; K.H. Cook; E. Corrales; M. Desort; S. Dieters; D. Dominis; J. Donatowicz; M. Hoffman; S. Kane; J.-B. Marquette; R. Martin; P. Meintjes; K. Pollard; K. Sahu; C. Vinter; J. Wambsganss; K. Woller; K. Horne; I. Steele; D. Bramich; M. Burgdorf; C. Snodgrass; M. Bode; A. Udalski; M. Szymanski; M. Kubiak; T. Wieckowski; G. Pietrzynski; I. Soszynski; O. Szewczyk; L. Wyrzykowski; B. Paczynski. Discovery of a Cool Planet of 5.5 Earth Masses Through Gravitational Microlensing. Nature. 2006, 439 (7075): 437 – 440. PMID 16437108. doi:10.1038/nature04441. ^ 28.0 28.1 J.S. Greaves; M.C. Wyatt; W.S. Holland; W.F.R. Dent. The debris disk around tau Ceti: a massive analogue to the Kuiper Belt. Monthly Notices of the Royal Astronomical Society. 2004, 351: L54 – L58. doi:10.1111/j.1365-2966.2004.07957.x. ^ Thompson, Andrea. Dead Stars Once Hosted Solar Systems. SPACE.com. 2009-04-20 [2009-04-21]. ^ G. Chauvin; A.M. Lagrange; C. Dumas; B. Zuckerman; D. Mouillet; I. Song; J.-L. Beuzit; P. Lowrance. A giant planet candidate near a young brown dwarf. Astronomy & Astrophysics. 2004, 425: L29 – L32. doi:10.1051/0004-6361:200400056. ^ Astronomers verify directly imaged planet 互联网档案馆的存檔，存档日期2010-06-30. ^ Astronomers capture first image of newly-discovered solar system (新闻稿). W. M. Keck Observatory. 2008-10-13 [2008-10-13]. （原始内容存档于2013-11-26）. ^ Hubble Directly Observes a Planet Orbiting Another Star. [November 13, 2008]. ^ R. Neuhauser; E. W. Guenther; G. Wuchterl; M. Mugrauer; A. Bedalov; P.H. Hauschildt. Evidence for a co-moving sub-stellar companion of GQ Lup. Astronomy & Astrophysics. 2005, 435: L13 – L16. doi:10.1051/0004-6361:200500104. ^ Is this a Brown Dwarf or an Exoplanet?. ESO Website. April 7, 2005 [2006-07-04]. ^ M. Janson; W. Brandner; T. Henning; H. Zinnecker. Early ComeOn+ adaptive optics observation of GQ Lupi and its substellar companion. Astronomy & Astrophysics. 2005, 453: 609 – 614. doi:10.1051/0004-6361:20054475. ^ Doyle, Laurance R.; Hans-Jorg Deeg. Timing detection of eclipsing binary planets and transiting extrasolar moons. Bioastronomy. 2002, 7. 引文使用过时参数coauthors (帮助) "Bioastronomy 2002: Life Among the Stars" IAU Symposium 213, R.P Norris and F.H. Stootman（eds）,A.S.P., San Francisco, California, 80-84. ^ Doyle, Laurance R., Hans-Jorg Deeg, J.M. Jenkins, J. Schneider, Z. Ninkov, R. P.S. Stone, J.E. Blue, H. Götzger, B, Friedman, and M.F. Doyle (1998). "Detectability of Jupiter-to-brown-dwarf-mass companions around small eclipsing binary systems". Brown Dwarfs and Extrasolar Planets, A.S.P. Conference Proceedings, in Brown Dwarfs and Extrasolar Planets, R. Rebolo, E. L. Martin, and M.R.Z. Osorio（eds.）,A.S.P. Conference Series 134, San Francisco, California, 224-231. ^ Hough, J. H.; Lucas, P. W.; Bailey, J. A.; Tamura, M.; Hirst, E.; Harrison, D.; Bartholomew-Biggs, M. PlanetPol: A Very High Sensitivity Polarimeter. Publications of the Astronomical Society of the Pacific. 2006, 118 (847): 1305–1321. doi:10.1086/507955. ^ Planetary Society charges administration with blurring its vision for space exploration. Planetary Society website. February 6, 2006 [2006-07-17]. ^ House Subcommitte Helps Save Our Science. Planetary Society website. June 14, 2006 [2006-09-12].